Switch to tab “Available charts” to add a new chart. There you can see the list of existing charts. “Is default” checkbox means the selected chart will be displayed on app site pages without selected chart ID and opened after click on the app icon on Site Contents page. Type a name of new chart. Then add one or several resources to be displayed in this chart. You may also create a new resource, using “Add SharePoint resource list” button (See the chapter “Create a new resource“). It is not possible to save a chart without any resources included. You may edit and delete resources and make a selected resource ReadOnly for users. Now, you have to define a default splitter position for this chart. This is a place of divider between the left (table) part of the chart and the right (timescale) part of the chart. 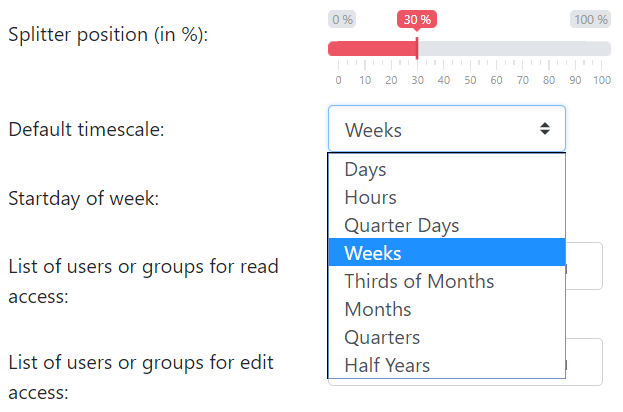 You can always change this proportion on chart view with drag-and-drop feature. You can also select the startday of the week for your scales (Sunday or Monday). You can set Read Only and Edit permissions for this chart for users and user groups. All users with Edit permission have also Read permission as well. Click “Save” to add chart.